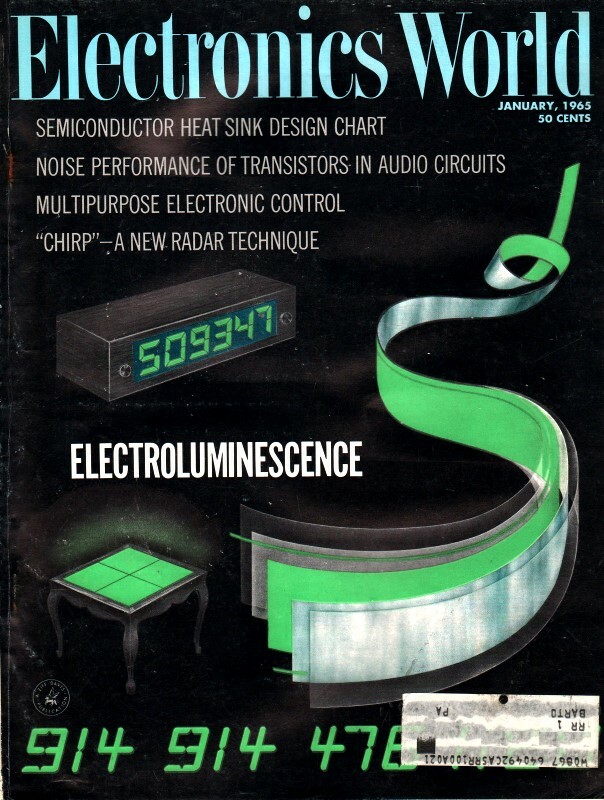 Electroluminescent (EL) devices were patented by General Electric back in 1938, but it was not until the 1960s that the fabrication process, involving copper-doped zinc sulfide (ZnS) as the light-emitting compound, had developed to the point where high volume production was feasible. Early EL displays exhibited short lifetimes and low efficiencies. EL panels are also referred to as light-emitting capacitors because of their construction geometry. Some of the first commercial applications for such EL panels were as back lighting in automobiles. Electroluminescence can also be obtained in semiconductors in the III-V group class like indium phosphide (InP), gallium arsenide (GaAs), and gallium nitride (GaN). By Lester W. Strock, Ph.D. / Sylvania Electric Products Inc. The cold light of electroluminescent devices is being put to ever increasing use in home and industry. Here is the theory behind them coupled with an explanation of how they are fabricated into various types of lamps and display items. The phenomenon of electroluminescence (EL) has made possible the commercial development of a true area cold light source. This has been a significant technological advance - both in the lighting and display-device areas. In the lighting area, applications are presently confined to those requiring brightness in the 0.5- to 100-footlamert range. The impact of EL has been significant in the display-device field because of the wide variation in sizes and geometrical shapes possible with EL. Individual letters and numbers are available in sizes from 1/4" up. Special units of segmented lamps, where the segments are combined at will by appropriate switching for forming any letter or number, are commercially available for incorporating into larger information display boards, such as airline information areas, for flight position markers, ad computer-fed displays, for example, in financial market centers. 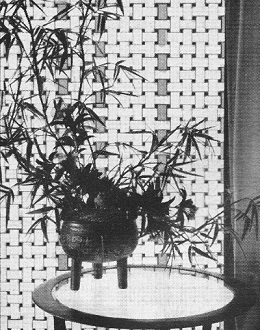 Decorative wall panel woven from colored strips of EL lighting tape. Electroluminescence is the phenomenon whereby light is emitted from a crystalline phosphor (zinc sulfide in present lamps) placed as a thin layer between two closely spaced electrodes of an electrical capacitor. One of the electrodes must be transparent. The light output varies with voltage and occurs as light pulses more or less in phase with voltage pulses. They are thus operated on a.c. with light output strongly dependent on power frequency. 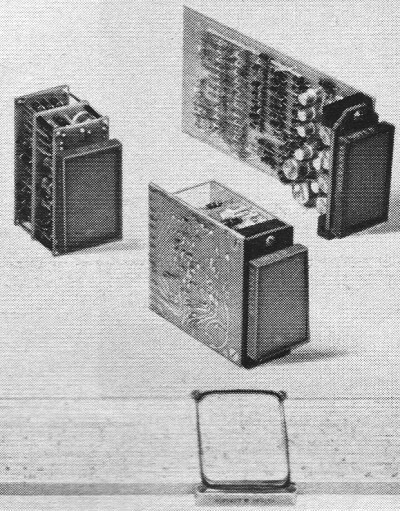 Solid-state modules designed to translate a four-bit binary code to a numeric-type readout on the front-mounted EL panels. 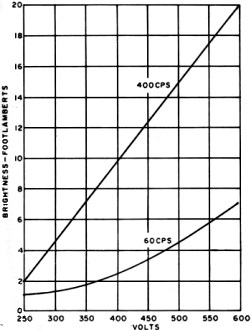 Since performance of the lamps is determined primarily by the characteristics of the phosphor, a detailed description of EL-phosphor properties and the electroluminescence mechanism is essential to an understanding of the unique character of various types of EL devices. The two chemical elements, zinc and sulfur, are familiar materials in science, industry, and the home. Sulfur was known to the ancients, while zinc was first prepared as a free metal in 1746. These elements readily combine to form a compound ZnS (zinc sulfide), which occurs naturally as the mineral zinc-blends or sphalerite - a major natural source of Zn (zinc) metal. The addition of small amounts of certain metals to ZnS, as it is prepared in the laboratory, converts this compound into a very important electronic and luminescent material. ZnS is the host crystal for a large family of phosphors. When excited by electromagnetic radiation of energy ranging from near-infrared wavelengths (2 microns) down to gamma rays, these phosphors emit light which collectively covers the entire visible spectrum. Chemically, the color variations are achieved by progressive substitution of Zn by Cd (cadmium) and of S (sulphur) by Se (selenium). Essential, however, is the addition of much smaller amounts (0.0001-0.1% range) of specific metals, of which Cu (copper) is a prominent and practical example, but also including Ag (silver) and Au (gold) as "activators." Likewise useful as "co-activator" is a halogen (prominently Cl, chlorine) or some normally trivalent material like Al (aluminum), Ga (gallium), In (indium), or rare earths. Methods of preparation also greatly influence the characteristics of a particular phosphor. ZnS phosphors have been known for a long time for their response to cathode rays as well as to 3650 Å ultraviolet excitation. An electron beam striking the face of a vacuum tube coated with ZnS phosphor generates the visual image of its path on oscilloscope, radar, and TV screens. Phosphate- and silicate-based phosphors are used on the inner walls of fluorescent lamps where the exciting radiation is of shorter wavelength (2536 angstroms in this particular case). G. Destriau reported excitation of zinc sulfide phosphors by an electric field as a scientific phenomenon in 1936, but the light emitted was so faint that some scientists cast doubt on the existence of the phenomenon. The first practical demonstration of electro luminescence was given by Sylvania at the I.E.S. technical conference in 1950. 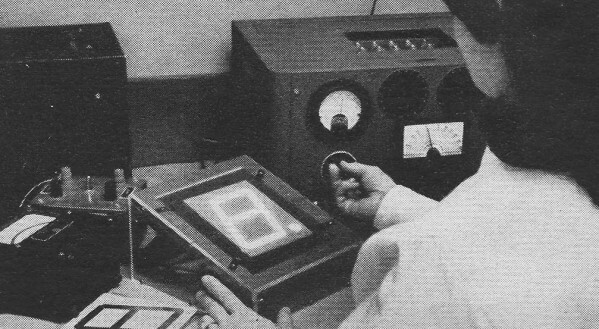 This clearly demonstrated that ZnS is a very important material having both interesting and practical electronic and luminescent properties. Thus it is that an increased knowledge of an old and previously used material like ZnS has become the essential component in new solid-state light sources and devices. It has been amply demonstrated that electroluminescence, as a phenomenon distinct from photoluminescence, is dependent on some unique structural peculiarity of the ZnS crystal, as well as its specific activator composition. This becomes evident from the fact that the application of thermal and mechanical stresses can be quite important in converting photoluminescent to electroluminescent phosphors. These stresses produce strains within the crystal, forcing a rearrangement of its atoms. For a brief review of the present theories of electroluminescence, refer to the boxed copy on page 26. The characteristics of EL phosphors are evaluated in the laboratory in demountable cells. Such cells may present a square or circular lighted area of 2 to 3 square centimeters. The viewing side is made of conducting glass plate which serves as one electrode of the electric capacitor. The powdered phosphor (small crystals, 10- to 30-micron size) is suspended in some liquid dielectric, such as castor oil, in a ratio of 1 cc. oil to 1 or 2 grams phosphor. The bottom electrode is made of metal (brass or steel) in some convenient and substantial design so as to provide a 3- to 5-mil spacing for the oil/phosphor mixture. Both electrodes are connected to a variable frequency and voltage a.c. power supply. Voltages in the 50- to 500-volt and frequencies in the 60- to 6000-cps range permit a thorough evaluation of phosphors for both scientific and industrial purposes. Flexible electroluminescent lighting tape can be made in lengths up to 150 feet. Strip is 1/32" thick with lighted width of 1 1/8". Electroluminescent numbers are used at O'Hare Field in Chicago in order to identify flight numbers and arrival of baggage. Light output can be measured with a photomultiplier detector and suitable current-reading instrument. Evaluation of the commercially significant parameter of life must be made on finished commercial products, as other factors also influence the life of the device using EL phosphors. Initial testing of electroluminescent numeric readout element. Unique features of EL lamps include: (1) their being an area light source, and (2) their lack of catastrophic failure. Both features are responsible for their special applications in areas of novelty lighting, instrument lighting, and the broader field of display devices. Device applications make use of another feature of EL lamps, namely their versatility in matters of size and shape. Being light sources, their immediate function in whatever circumstances is to render something visible. This may be accomplished by reflected light, in creating a silhouette, or by its own luminosity. One thing is certain: an EL device is a solid-state light source and, as such, be combined with other solid-state components to provide an all-solid-state system. The fact that EL light is available from luminous areas of a few square millimeters to a square meter or more, gives EL a broad application range from tiny readout lamps to very large information display boards. The actual construction of the EL lamp is determined by its intended application. There are, at present, three types. The major application of the metal-ceramic construction is in lamps intended as low-level light sources. Their essential components are shown in Fig. 1. Present commercial products include: nighttime position markers (Nite Lites); switch plates, luminous background advertising items; clock faces; telephone, radio, and TV dials; automobile instrument panels; highway signs and markers; and decorative panels (in a variety of colors) for walls, ceiling, and space dividers. This lamp is of rugged construction and long life (in the neighborhood of 10,000 hours or more when operated at 60 cps). It can be made to operate in the range of 50 to 1000 volts to produce surface brightness from a few tenths to 100 foot-lambert's. Most current commercial units fall into these types: 120 volts, 60 cps yielding 1 to 1.5 foot-lambert's; 250 volts, 400 cps yielding 5 to 6 foot-lambert's, or 10- to 30-footlamberts range at 600 volts. 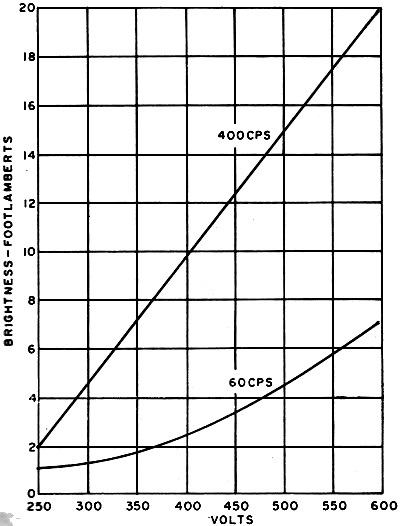 By increasing voltage and frequency (e.g., 600 volts, 2000 cps), brightness in the neighborhood of 100 foot-lambert's results. No lamp should be operated above manufacturer's ratings. Fig. 1. Example of five-layer, metal-ceramic construction. A. typical brightness-voltage characteristic is shown in Fig. 2. Increasing the frequency will not harm the lamp, but unless rated for high-frequency operation, no spectacular increase in brightness may result. Fig. 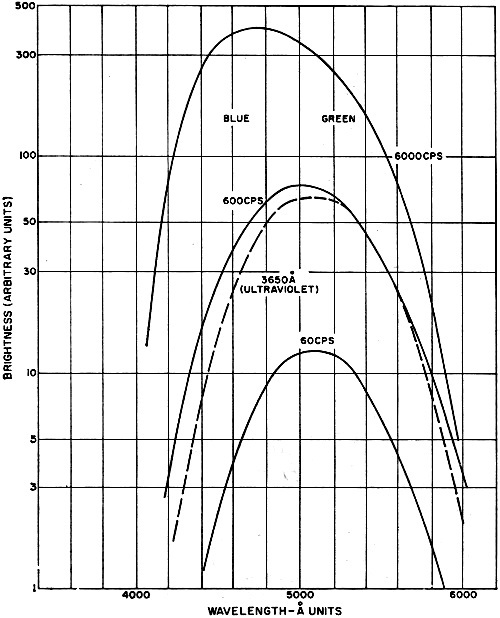 3 illustrates, in the case of a particular EL phosphor, the brightness at three different operating frequencies, as well as the shift in color toward blue at higher frequencies. This is a result of the more rapid rise of output by the blue component in a two-band (blue-green) phosphor. Since phosphor life is closely proportional to operating frequency, obtaining high brightness in this manner is at the expense of life. Fig. 2. Brightness versus lamp voltage for a 600-volt EL device. Note also how increasing excitation frequency raises brightness. The designation metal-ceramic refers to the use of an iron sheet as one electrode and the ceramic (low-melting-point glass) phosphor embedment material in its construction. A second ceramic layer can be placed between the iron plate and phosphor layer. The second electrode should be transparent. It is applied in the form of a conducting tin-oxide layer sprayed onto a thin glass layer over the phosphor layer, which is, in turn, usually covered by a second glass layer for moisture, mechanical, and electrical protection. Special spraying techniques for forming thin and uniform layers have had to be developed by manufacturers of EL units, and for sintering glass frits into transparent glass layers. The active phosphor layer of such lamps varies from about 2 to 8 mils depending on rated operating conditions. Fig. 3. Effect of frequency on wavelength distribution of the EL emission of a two-band phosphor peaking at 4600 and 5200 A. For space lighting applications, special blends of blue, green, and yellow phosphors have been incorporated into lamps for producing various tones of white light. Fig. 4 shows the frequency response of such a white blend designed for 60-cps operations (voltage affects color in only a minor manner). Fig. 4. Light emission in different color bands of an EL phosphor blended to produce white at 60 cps. Note frequency effect. 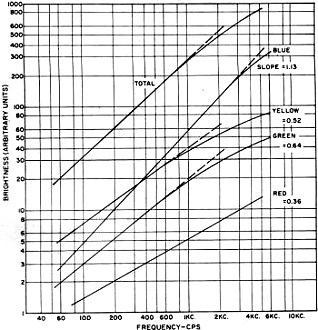 The various slopes for the different color components, as described previously, cause a decided color shift in emitted light when a lamp is operated at different frequencies. Besides the metal-ceramic makeup, glass-ceramic construc­tion is also employed. This is the construction favored for lamps used in display applications, since it provides a flat surface for displaying information. In it, the active phosphor layer is placed directly on the conducting surface of the glass plate without an intermediate ceramic layer. This decreases the diffusion of light within the lamp and leads to sharper readout patterns. Finally, the back electrode is advantageously made of an evaporated metal film which adapts itself to segmentation for the purpose of applying voltage to selected localized areas of the lamp. This is done by vaporizing the back electrode through appropriate masks. These lamps are normally made to operate at 250 volts and 400 cps to produce an over-all brightness of approximately 10 foot-lambert's. In this type of construction (see this month's cover), the initial electrode is again of metal; normally a thin aluminum foil. It is first coated with a thin uniform layer of white high-dielectric material, followed by a mixture of phosphor in a high-dielectric organic material which is converted to a tough plastic film on baking at relatively low temperatures. The second electrode and light-escape side of the lamp is a thin conducting glass paper cemented to the phosphor layer. The entire EL unit is then sealed in a moisture and electrical protection envelope. The assembly is approximately 1/32-inch thick, with a 1" to 5-mil separation between electrodes. At 120 volts, 60 cps, this construction is a 5-footlambert light source which increases to 30 foot-lambert's at 120-volt and 400-cps operation. This construction is suitable for the production of lamps in long strips, in widths up to 8 or 12 inches. 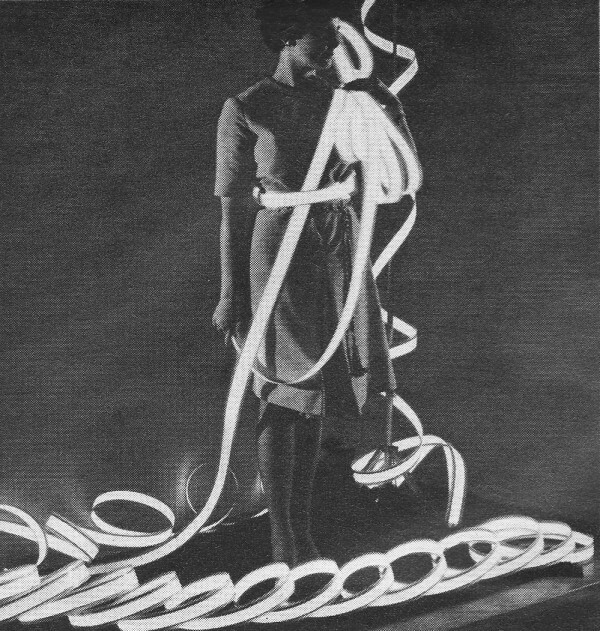 A commercial version of this construction is the "Tape Light," recently made available by Sylvania in 1 3/4-inch widths. The potential application of this flexible lamp in lengths of many feet would seem to be great, considering that it will take the shape of a variety of surfaces employed in contemporary design and construction. Like the other lamp types, phosphors are available for producing "Tape Lights" in a variety of colors (green, blue, white, yellow). The various types of construction just described may be used primarily for lighting purposes, or in special device applications. In practice, the display applications are at present largely confined to the glass-ceramic construction for reasons already stated. There remains to briefly summarize the manner in which the operation of lamps is altered, compared to their more simple use as light sources, when the intended use is as a display. The problem is to convert the uniform area light into a field of contrasting brightness so as to present a visual message to an observer or objective detector. Basically, this means varying voltage across the active phosphor layer from place to place in the lamp. In practice, this means operating the lamp in localized segments at either of two voltages, namely, at zero (or below threshold) and some finite value which will excite electroluminescence. The "on-off" operation scheme is widely employed. The mechanics of doing this are provided by appropriate segmentation and design of the back electrode (metal film applied through masks). The problem is simple if a fixed stationary display is the goal. But more important, EL devices make possible variable displays. This adds complexity to their construction since various combinations of component elements of a design must be selectively activated. This requires switching of the operating power via wiring circuitry connected to thin metal films between segments of, at times, very small areas. The simplest variable display device is a seven-segment numeric readout, such as the one shown in Fig. 6A. This is commercially available to give numbers ranging in size from 3/8" to 8" in height. Connecting these seven segments electrically (via the back electrodes of the lamp) in various combinations forms all numbers 0 through 9. This simple arrangement of segments cannot center the digit "1." In order to center the digit "1,"a 9-segment device is available (Fig. 6B) which can be operated as an 8-segment lamp. The switching arrangement is only slightly more complicated. A far greater range of readout applications is provided by a 14-segment lamp (Fig. 6C) with which letters of the alphabet as well as digits can be displayed. This is the familiar alphanumeric readout. The added segments, however, substantially increase the switching, electrode contacting, and connecting problems. By increasing the number of segments and changing from rectangular to circular segments, more aesthetically pleasing number and letter displays are obtained. 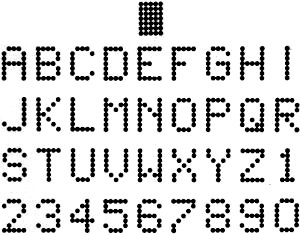 The familiar 35-dots-per-letter in a 5 x 7 array is the best-known example. Others have been developed. The practical problems become formidable with these multi-segmented lamps, both in circuitry, switching, and in applying the segmented electrode itself. Display units have been developed which carry several numerics on one lamp. This provides space economy, reduces hardware, and provides clearer viewing. Fig. 6. (A) Seven segment readout, (B) nine segment readout, and (C) 14 segment readout. These are alphanumeric displays. Fig. 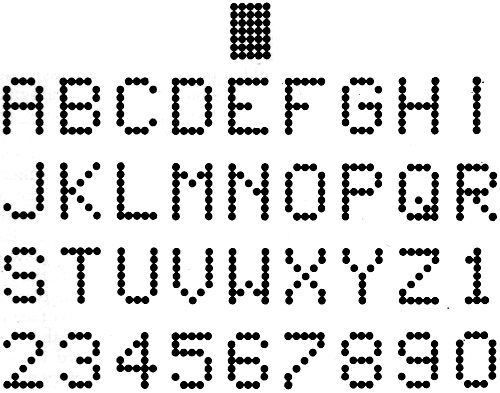 5 shows the complex alphanumeric pattern using the 35-dot 5 x 7 array, along with a sample of the display obtainable by its use. Increased visibility of display is possible by use of neutral gray (60-70% transmission) glass in the lamp. Surface reflections are reduced by application of anti-reflection coatings to the glass. The use of a glass-surface lamp makes it possible to apply a honeycomb filter for purposes of reducing the effect of high ambient light. This, however, restricts the viewing angle to approximately 30°, but makes it possible to use it in sunlight. Fig. 5. A complex display pattern using 35 dots in a 7 x 5 array can be used to produce a complete set of alphanumerics. The switching component requirements of EL-display devices depend on the speed demanded by the application. Mechanical switching is employed in electronic accounting and scaling equipment and in production-line status boards. For more rapid switching requirements and in conversion of intelligence from a computer, electronic switching is employed through the use of silicon controlled rectifiers, neon-photoconductors, reed switches, and transistor circuits. With the versatility in size, geometrical form of information display elements, and switching speeds now available, the possible applications of EL-display devices seem almost unlimited. Producers of EL devices naturally stimulate those interests by continued assistance and developments. Efforts are continually being made to develop phosphors and lamp structures which will substantially increase the brightness of present EL light sources, so that lamps may eventually be as bright on domestic power operation as now obtainable at higher voltages and frequencies. Brightness up to 100 foot-lambert's, sufficient for ceiling and wall panels incorporated into the architectural structure, are not unrealistic expectations to those engaged in product development, and perhaps more so to those of us in basic research. A ZnS crystal consists of alternating layers of zinc and sulfur atoms. Much lower fields (factor 10 or more) are required to produce light when the field is applied parallel to these layers. Since high conductivity also exists parallel with the "easy" EL direction, light emission in this direction is evidently dependent on the flow of external electrons. In the perpendicular direction (called the c-axis) light emission involves displacement of electrons already present in the crystal. An EL crystal thus seems to emit light by two mechanisms: (1) low-field/high-current for a field parallel to atom layering or perpendicular to crystal c-axis, and (2) high-field when the field is perpendicular to the layering. This directional dependence or anisotropy (different properties in different directions) has been explained by the author as resulting from an isolated atom displacement disorder. Such a disordering of the otherwise regular repetition pattern of Zn- and S-atoms of the ZnS crystal causes a sulfur atom to move under the influence of local strains into a nearby and alternate (but unoccupied) position of the crystal lattice. As a result, a covalent chemical bond (electron pair) by which this displaced sulfur atom was attached to one of its normal four Zn-atom neighbors has been broken. The geometry of the immediate site, after creation of this disorder, is such that a single charged copper ion (Cu+'-ion) can be ex­actly fitted into the space next to the broken band on the displaced S-atom. This "quasi"-free Cu+1-ion restores a more normal local energy situation. This seemingly trivial matter of moving an isolated S-atom for a very short distance of about 4 A (angstroms) to a neighboring site, followed by entry of a Cu+1-ion adjacent to it, provides a model useful far developing the details of a light-emission mechanism from an entirely different viewpoint than previously attempted. ZnS crystals are typical "wide-band-gap" semiconductors, and previously proposed theories have been based largely on energy-band-gap models. The band gap of ZnS is 3.76 electron volts (ev.). This means that energies of this amount are required to excite electrons associated with atoms on lattice sites of the crystal (valence band) to the conduction band where they may move for a very short time about the crystal as "conducting" electrons. Activators in a ZnS phosphor add new levels in the "forbidden" gap of ZnS at levels up to 1 ev. above the valence band. Since light absorbed by the activators is normally of shorter wavelength (higher photon energy) than that emitted, the phosphor has served as a wavelength or color converter. 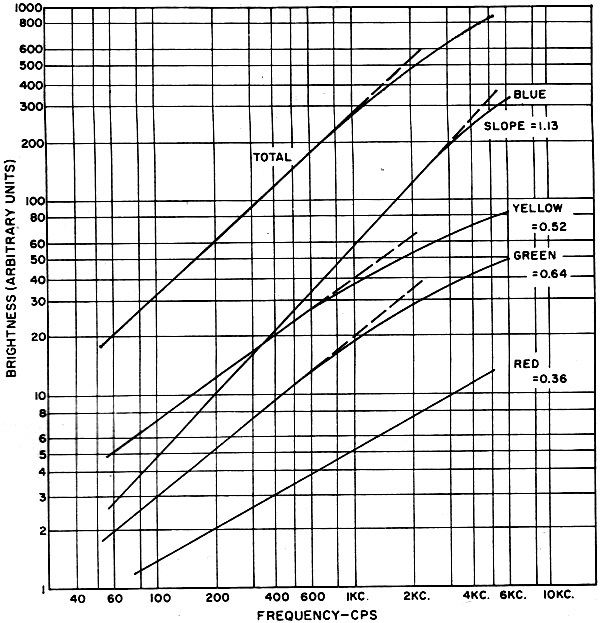 In the case of the ZnS:Cu-Cl EL phosphor most widely used, absorption of 3650 A leads to emission of two wide bands: the blue peaking at about 4600 A and the green peaking at about 5200 A. These represent electron transitions of 2.70 and 2.4 ev. between activator levels and trap levels a few tenths of an electron volt below the conduction band. Although satisfactory for the description and calculation of photoluminescence phenomena, the energy-band model has not been able to treat all of the features of electroluminescence. Mainly there is the question of how the energy of the electric field, applied to lamps at levels of 50 to 100 volts per mil, is transferred to the phosphor to cause light emission. Even if the prime characteristic of electroluminescence is just a special mechanism for triggering off photoluminescence which then proceeds via the collision-ionization mechanism commonly accepted in electroluminescence theory, the question of the source for initial electrons remains. They do not seem likely to be created by direct-field ionization of luminescence centers because this will require fields acting on individual Cu activator atoms, e.g., to produce blue emission, in excess of that generally available by a factor 2280 in case of a 1-mil-thick device operated at 120 volts. To produce blue emission, energy in excess of 2.7 ev. must be applied across a Cu-atom of 2.7 A diameter representing a field of 1 volt/A or 108 volts/cm. The available field is actually only 4.4 X 10-4 volt/A. Concentrating the 120 volts available into a very small fraction of the active layer thickness; e.g., 120 A will produce a field adequate for direct ionization for purpose of supplying the initial electrons, which are then accelerated to velocities sufficient to collision-ionize other centers. The assumption of the existence of such barriers has been a prominent feature of previous EL theories. The field-release of electrons from donors or from traps a few tenths of a volt below the conduction band has been proposed in order to account for the release of electrons at low values of field intensity. It is also possible to explain the above-mentioned anisotropy of EL emission by the isolated atom displacement model. Its essential feature is that in the EL center there exists an atom-ion pair oriented with its join line perpendicular to crystal c-axis. EL emission results when an electron oscillates between the atom and ion in phase with an a.c. field. The extent to which this electron exchange process produces light directly by optical transitions and indirectly by virtue of furnishing electrons which escape the center into the surrounding host crystal, where on acceleration they ionize normal photoluminescence centers, is still unknown. Assuming the essential correctness of the EL-center model, the chemical entity of the atom-ion pair will determine the color of EL emission. If some electrons escape from the center to trigger off the characteristic photoluminescence of the host crystal, the light emitted will be a composite of the output of the two mechanisms involved. 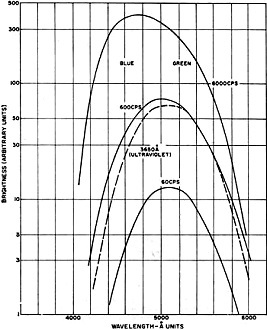 The close similarity of some bands of light emitted by an EL phosphor under ultraviolet light and field excitation has long been a point of interest which, on the basis of the model, indicates that a substantial portion of electrons from the center do escape to the surrounding crystal, especially at low frequencies. However, as frequency increases, the number of electrons escaping the center will decrease, confining. light emission more and more to the primary EL mechanism, with less from the host crystal. That this does happen receives support from the known frequency characteristics of the widely used blue-green ZnS:Cu-Cl EL phosphor. Here, the blue component emission increases steadily with frequency and at a much faster rate than does the green component. Further, green emission soon reaches a plateau. In line with the theory, the blue component is the prime EL emission generated by the EL center; while green is photoluminescence originating at luminescence centers of the surrounding crystal. Attempts to convert yellow photoluminescent phosphors to EL phosphors have revealed that frequently any EL emission created is blue. Most EL yellow phosphors contain a blue component. In this case, electrons do not escape to yellow centers in the surrounding crystal. The study of EL phosphors in the laboratory is thus a very essential step in the development of commercial EL lamps.